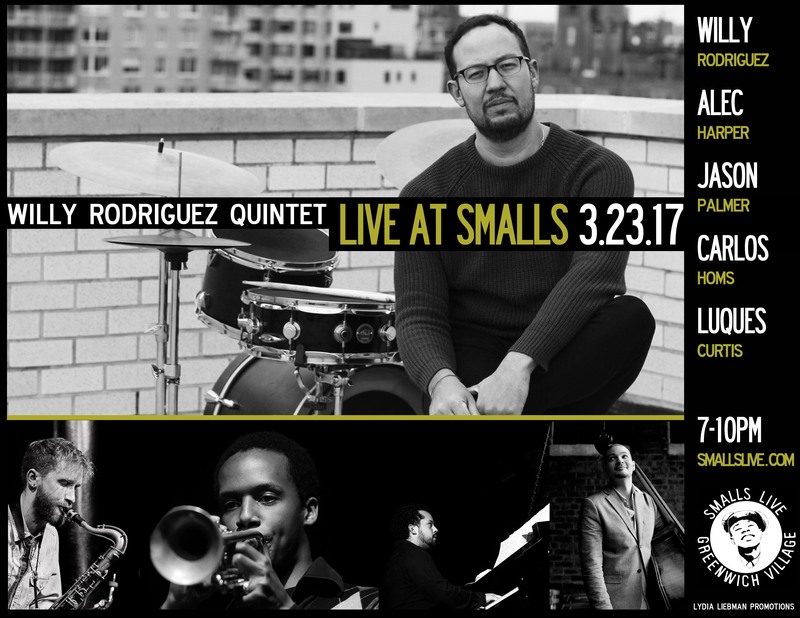 The Willy Rodriguez Quintet, featuring drummer Rodriguez with trumpeter Jason Palmer, saxophonist Alec Harper, pianist Carlos Homs and bassist Luques Curtis will be appearing at Smalls Jazz Club,located at 183 West 10th Street in New York, NY on Thursday, March 23rd from 7:30-10:00 PM. Doors open at 7:00. More details can be found online at SMALLSLIVE.COM. Featuring five of the most distinctive voices of modern jazz, the Willy Rodriguez Quintet is a newly formed collective that blends the musical nuances of jazz’s forefathers with contemporary compositions and sounds. The repertoire includes original compositions by each of the musicians tinged with their respective cultural and musical influences; the music is infused with a spiritual essence that harkens back to the transcendent notions of the 1960’s and nods to the social issues of our time. While the Willy Rodriguez Quintet formation is new, the members of the group have a musical relationship that exceeds a decade. This long-standing bond is evident in the quintet’s lively and engaging live performances that showcase the dynamic and unique voice of each member. About Willy Rodriguez: Drummer and percussionist Willy Rodriguez (”he plays with a hypnotic quality” Jazziz Magazine) was born in Ponce Puerto Rico. A graduate of Berklee and New England Conservatory, Willy’s reputation in the Boston area grew due to his association with Wally’s Jazz Cafe, the famed jazz club located in Boston’s historic South End, where he conducted the famous weekend jam sessions. Eventually, Willy began performing every Thursday at Wally’s with his group ‘The 427 Factory’ featuring a rotation of Boston’s leading musical voices. In 2015, Rodriguez relocated to New York City.